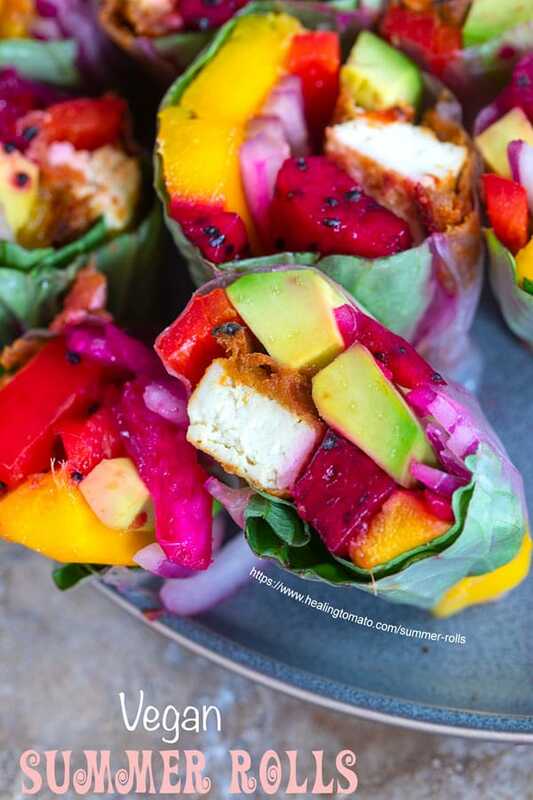 How do you make summer rolls? I like to put tofu roasted in peanut satay sauce and surrounded by fresh fruits, veggies and fresh basil leaves. Plus, I get to use dragon fruit in this recipe and it made me beyond happy. The dragon fruit in this recipe definitely steals the show! I haven’t had summer rolls since I left NJ. 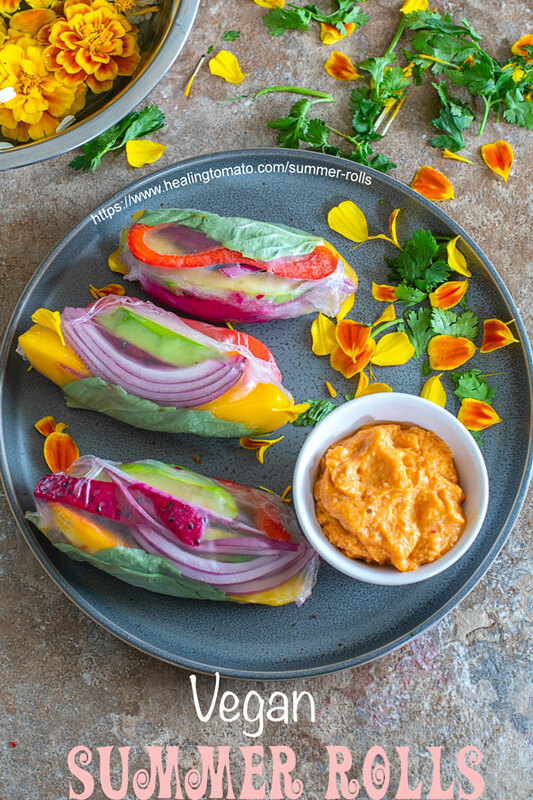 I have missed eating summer rolls and I thought it was about time I made my version of summer rolls because they are just too darn irresistible! These are so colorful, aren’t they? I tried to capture as much vibrancy of summer as I could into this recipe. 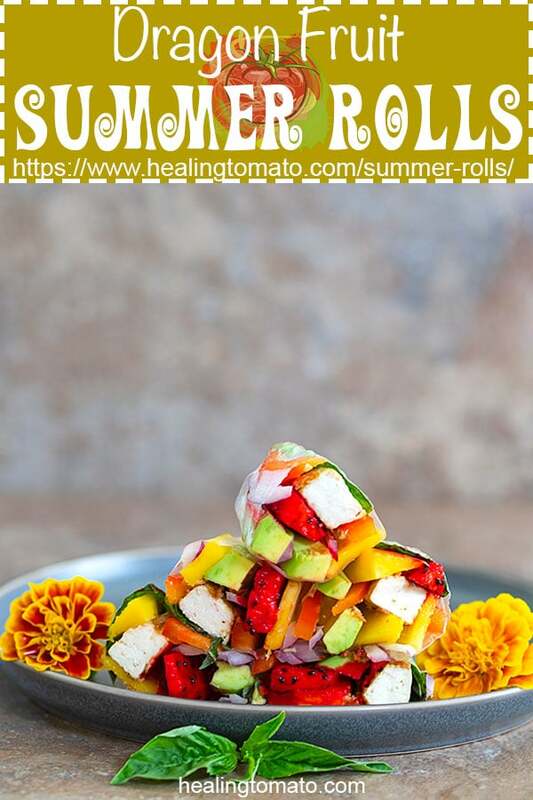 What fruits should I put in a summer roll? What is the difference between summer rolls and spring rolls? 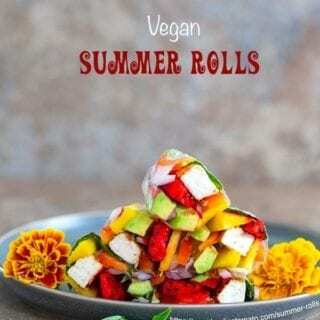 How to serve summer rolls? How to tell if a dragon fruit is red or white on the inside? 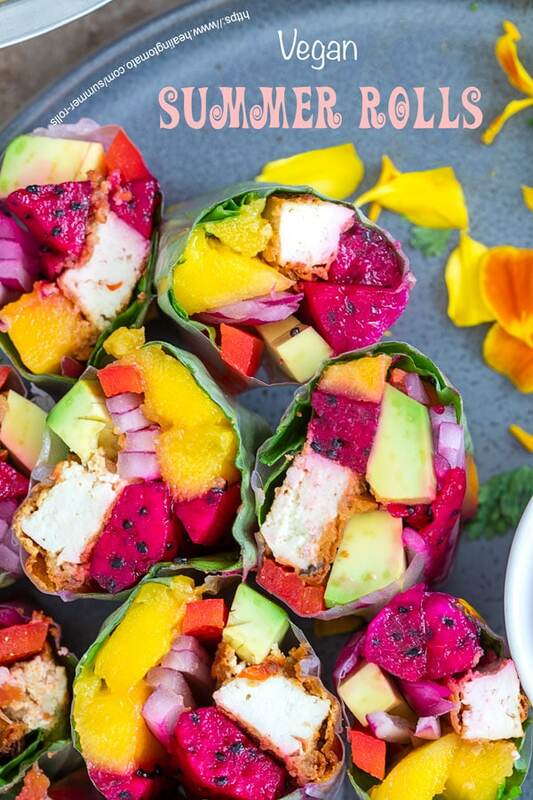 Any fruit that is in season can work in the summer roll. The only exception I would say would be bananas. They just don’t roll well. Nothing! They are both the same recipe. Having said that, I have seen spring rolls are referred to vegetarian / vegan recipes only. Also, spring rolls can be fried and use wonton paper instead of rice paper. However, for the most part, summer rolls and spring rolls are the same thing. They are so colorful and represent the vibrancy of both summer and spring. How do you like to refer to them? Cut the summer rolls into half and serve with my homemade peanut satay sauce. I like to dip the summer rolls in the peanut satay sauce and devour them immediately. I also baked the tofu after coating them in the same peanut satay sauce. For me, tofu tastes better when its cooked in some way. Cooked tofu is easier to digest, in my opinion. Also, the peanut satay sauce really flavors the tofu and the other ingredients. It adds so much flavor to the rolls. P/S: If you find yourself in Long Branch, NJ Check out The Ocean Cafe. 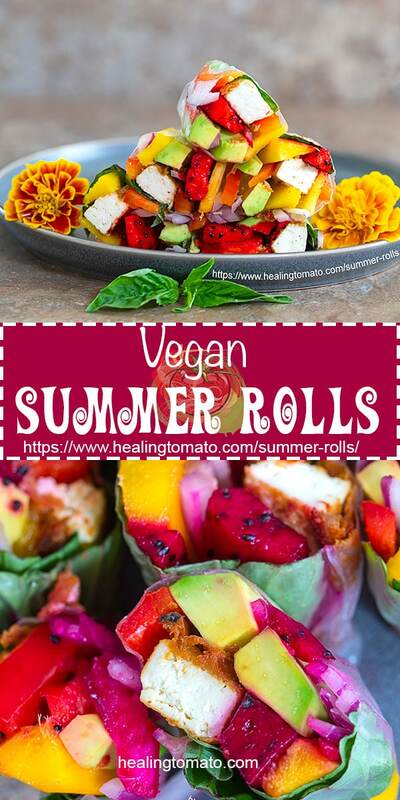 They make amazing rolls along with other delicious recipes. They are not paying me to talk about them. I am just a huge fan of their food. Dragon fruit is one of my favorite fruits in the world. It has a very unique shape and gets its name because they look like dragon eggs. Their real name is Pitaya or Pitahaya which is part of cactus family. They look like cactus, don’t they? Dragon fruit is from Mexico and the Central American region where its very popular. However, they became a huge part of the Chinese diet a few decades ago and that’s why you might see them in some of their cuisine. Today, dragon fruit is grown in US (California, Florida, Hawaii), Australia and parts of the Caribbean. If you reside in any of these locations or in a climate where there is no frost or freeze, you could easily grow your own dragon fruit. While I was researching for this post, I discovered that they are surprisingly easy to grow. Check out these videos on you tube that show you how easy it is to grow Dragon Fruit in your backyard. A friend visited Thailand a few years ago and they sent pics of seeing dragon fruit juice being sold on the side of the road! How cool is that!! I would love to taste their dragon fruit recipe some day. Its now on my bucket list of things I should try! Have you been lucky enough to drink dragon fruit juice in Thailand? Feel free to brag about it in the comments section. Here, in central Florida, I have only seen the red and white varieties of Dragon fruit. Out west and In Hawaii, you will find the yellow version of dragon fruit. This is one case where I absolutely have a favorite and that happens to be the RED dragon fruit. The red dragon fruit is my favorite version. It is “meatier” than the white version and is slightly sweeter too. They are round and have a red skin with green cacti(?) growing out of the skin. When you cut into it, they are a dark red color and have black seeds in them. Its so colorful that they instantly add color to any recipe that you put them into. Given their “thickness” and bright color, they are incredibly popular with the smoothie crowd. They make a delicious smoothie bowl, especially when topped with all kinds of healthy ingredients. P/S: If you are part of the smoothie crowd, try my avocado smoothie, mandarin smoothie or my ultimate smoothie blast. 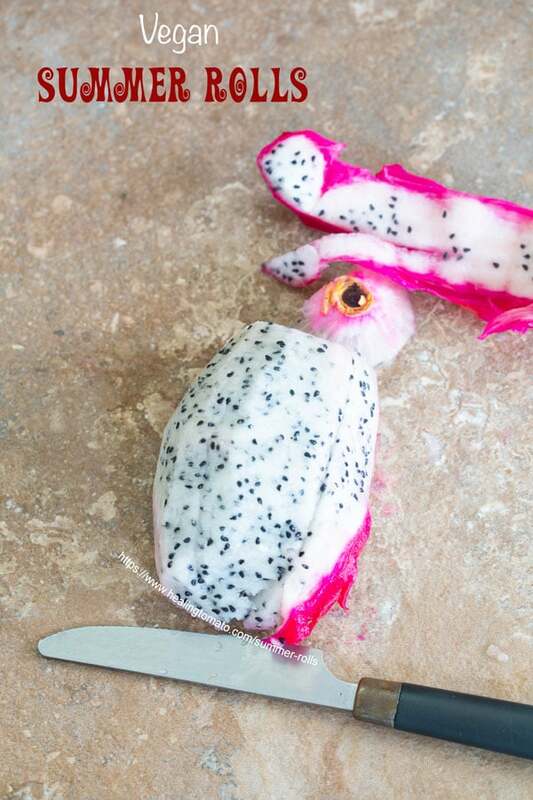 Although the skin is pink, when you cut into it, the dragon fruit is actually white pulp with black seeds. They are longer in shape and have a lighter pink skin. Just like their red counterpart, white dragon fruit has the consistency of kiwi. Its not as sweet as the red ones and have a very slight tang. Their white color makes them popular in juice drinks and fruit salads. My favorite recipe is using them in a melon balls type of recipe. It adds such a wonderful contrast to the colors. I haven’t used them on this blog before, but, I am planning on a delicious summer recipe using the white version. So, stay tuned. In the meantime, tell me how you like to use these white dragon fruits. P/S: if you are looking for a melon salad, check out my melon-arugula salad in a cinnamon pita recipe. Well, in recent years, grocery stores have started putting a label on the outside which shows if the dragon fruit is red or white on the inside. * Look at its skin color. This is one time where its ok to judge by the color of the skin. The red dragon fruit have a redder skin on the outside. The white one have a lighter pink skin on the outside. I think this might cause some controversy, but, I don’t like using regular knives on dragon fruit. I use butter knife which is gentler on the dragon fruit. Plus, butter knife leaves ridge like cutting on the dragon fruit which gives them good texture in any recipe where they are the star. Dragon fruit works best when its cold. Its easier to cut into or shape. If you are using a melon baller, you will find it easier to make tiny balls out of it when it has been chilled for about an hour. Also, do not freeze them because they will be a mess when thawed out. When you are at the grocery store and you see a basket full of dragon fruit, how do you know which one to get? You want to pick the “not-yet-ripe” dragon fruit. The un-ripe ones will have brighter pink or red skin. The green cacti leafs are sharp and point-y! Also, the fruit is firm when you try to squeeze it. When the fruit begins to ripen, you will notice that its softer when you squeeze it. Also, the green leaves are droop-y and have started to brown. Also, the outer red color looks darker. That’s when you know that the fruit is ripe and ready to eat. The riper the fruit, the sweeter it tastes. So, I like to bring the unripe ones home from the grocery store and store them in a dark corner for a day before refrigerating it. 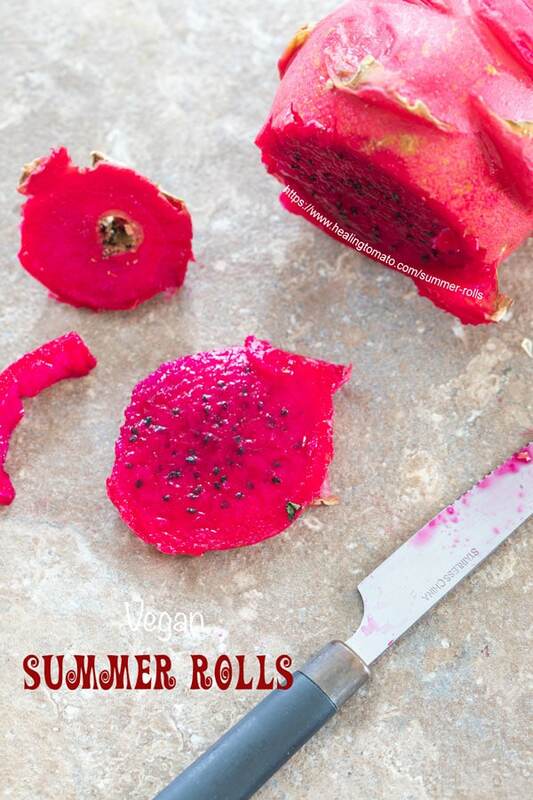 Now that you know everything there is to know about dragon fruit, let’s make these delicious summer rolls! If you want more summer recipes, check out my summer lemonade and tropical fruit smoothie. 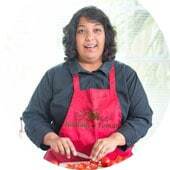 P/S: I also have a vegetarian rolls recipe using paneer and rice paper. Check it out and let me know what you think. What’s your favorite dragon fruit? 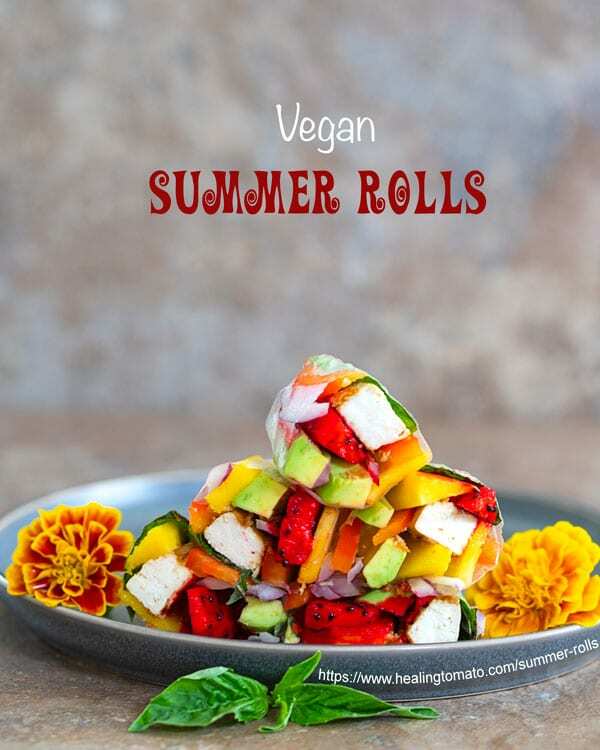 - This tofu rolls are best when consumed fresh. Tried this recipe?Follow me @healingtomato1 and mention #healingtomato1! Spam is not vegan, so, you wont get any from me!